Advice to our customers following the abolition of the paper counterpart to the UK photocard licence. On 8 June 2015, the photocard paper counterpart stopped being a legal document and the DVLA also stopped updating any old style paper licences. All your driving history is now held on the DVLA central computers. Please watch the following video for their advice. 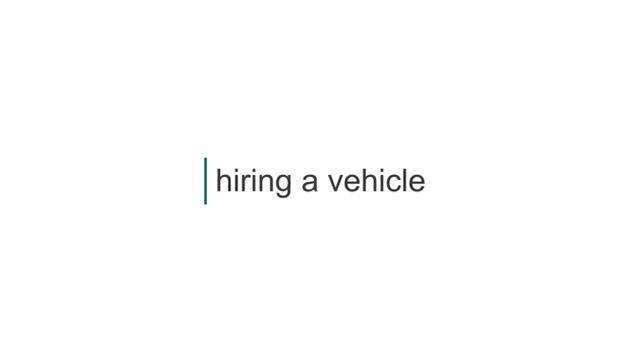 How will this affect the way you hire a vehicle? UK driving licence holders hiring within the UK now need to use "Share Driving Licence", the new online service from the DVLA, for validation of their driving record. "Share Driving Licence" is available online at www.gov.uk/view-driving-licence. A UK licence holder will need to access "Share Driving Licence" no more than 7 days before collecting their rental vehicle to generate a one-time passcode. Details of their driving licence number, national insurance number and home postcode will be required for this. The passcode is valid for a maximum period of 21 days and must be presented when picking up the hire vehicle. If you do not generate your one time passcode: We can help you obtain the passcode by giving them access to the "Share Driving Licence" when you come to pick up your vehicle, however, you should keep in mind that they will need to have the same information to hand when you access the DVLA website - whether that be at home or at our premises. You will need to have your National Insurance number at hand when you are accessing the DVLA websitesite and collecting your vehicle.